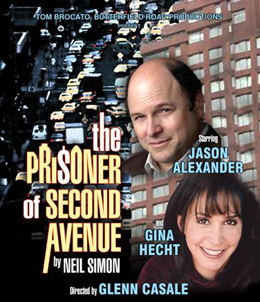 Producer Tom Brocato's Butterfield Road Productions has announced a special three-week engagement of the comedy The Prisoner of Second Avenue by Neil Simon, starring Jason Alexander and Gina Hecht. Directed by Glenn Casale, the production will begin performances at the El Portal Theatre in North Hollywood on April 21 for three weeks only. Opening is set for Saturday, April 23 at 8pm. Performances will continue through May 15. The Prisoner of Second Avenue revolves around the escalating problems of a middle-aged couple living on Second Avenue on the Upper East Side of New York City. Mel Edison (portrayed by Alexander), has just lost his job after many years and now has to cope with being unemployed at middle age. The action occurs during an intense summer heat wave and a prolonged garbage strike, which just exacerbates Edison's plight to no end as he and his wife Edna (Hecht) deal with noisy neighbors, loud sounds emanating from Manhattan streets, and even a robbery of their apartment in broad daylight. Mel eventually suffers a nervous breakdown from the whole affair, and it is up to the loving care of his brother Harry, his sisters and his wife Edna to bring Mel back to a firm reality. Neil Simon's 1971 play walks a tightrope between comedy and drama in this bittersweet tale. The play is perhaps more relevant today than it was when it first debuted on Broadway 40 years ago. The original Broadway production, which starred Peter Falk and Lee Grant, opened in 1971 and ran for and ran for two years, closing in 1973. It was nominated for a Tony Award for Best Play. The stage play was adapted into a successful film in 1975, starring Jack Lemmon and Anne Bancroft. Last year, there was a stage revival presented in London's West End. Jason Alexander is best known for his role as George Costanza on the television series Seinfeld, appearing on the sitcom from 1989 to 1998. He began his acting career on the New York stage, appearing in several Broadway plays and musicals, including Sondheim's Merrily We Roll Along, Kander and Ebb's The Rink, Rupert Holmes' Accomplice, Neil Simon's Broadway Bound, and Jerome Robbins' Broadway, for which he won the 1989 Tony Award for Best Actor in a Musical. Alexander appeared in the Los Angeles production of The Producers with Martin Short at the Pantages Theatre, and is currently the artistic director of the Reprise Theatre Company. Gina Hecht has enjoyed a wide and varied career on stage, in film, and on television. In prior collaborations with director Glenn Casale, Gina appeared in productions of Wrestlers, Circle of Will, as well as in a production of Night Owls, winning Drama-Logue and LA Weekly Awards along the way. She has been in over a dozen films, including Night Shift (with Henry Winkler) and more recently Seven Pounds (with Will Smith). Television work includes recurring roles on Mork and Mindy, Heartbeat, Everything's Relative, Life Goes On, The District, Any Day Now, Seinfeld, and Hung. Glenn Casale directed Peter Pan (starring Cathy Rigby) on Broadway, a production that was Tony Award-nominated for Best Revival, and it was later filmed by A&E, garnering two Emmy Awards. Casale has directed internationally numerous times, including productions of The Wiz (Netherlands), and Disney's Beauty and the Beast (Netherlands, Berlin, Antwerp, Madrid). Tours and regional credits include Ballroom (starring Tyne Daly and Charles Durning), Wrestlers, Bingo! The Musical, From the Top (starring Carol Burnett), and the Ovation Award-winning Reprise production of Anything Goes. Casale is the artistic director of the California Musical Theatre in Sacramento. The Prisoner of Second Avenue will play two lower-priced preview performances on Thursday, April 21 and Friday, April 22 at 8pm, and opening night is set for Saturday, April 23 at 8:00. The regular performance schedule is Wednesday through Saturday at 8pm, Sunday at 6pm, with matinees on Wednesday, Saturday and Sunday at 2pm. The three-week-only engagement will continue through Sunday, May 15. All preview seats are $40, and regular ticket prices range from $45 - $55, with a limited number of VIP seats available at $75 and $80, which include a post-performance meet-and-greet with Jason Alexander, an autographed photo, and a voucher for two drinks at intermission. To purchase tickets, visit www.elportaltheatre.com, or call (866) 811-4111 or (818) 508-4200.